GSMArena team, 05 February, 2016. The retail package stocks all necessities. There's a Quick Charge 2.0 charger and a microUSB 2.0 cable to go with it. You also get an in-year headset with a three-button remote. The Samsung Galaxy A7 (2016) is marginally smaller than the S6 edge+ and the Galaxy Note5. In terms of thickness it falls between the two and it weighs as much as the Note5. 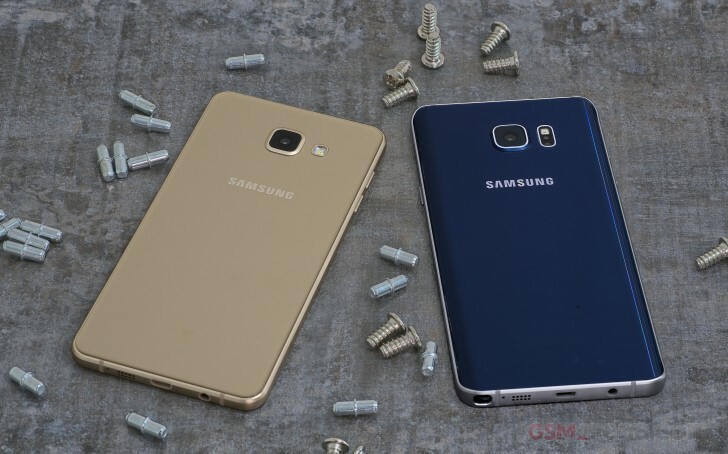 Compared to its sibling, the Galaxy A5 (2016), it's slightly taller and wider. Unless you have both side by side, you can't really tell which phone you're seeing. Samsung design - indeed smartphone design in general - doesn't allow for much variety, so the devil is in the details. We're glad to say, the Galaxy A7 (2016) has nailed the details. It's the combination of the sculpted 2.5D Gorilla Glass 4 on the front and back and the chamfered metal frame that bring along a great premium feeling. For one, these are some high-quality materials, for another, the rounded edges make the phone very comfortable to hold even with its 172g. 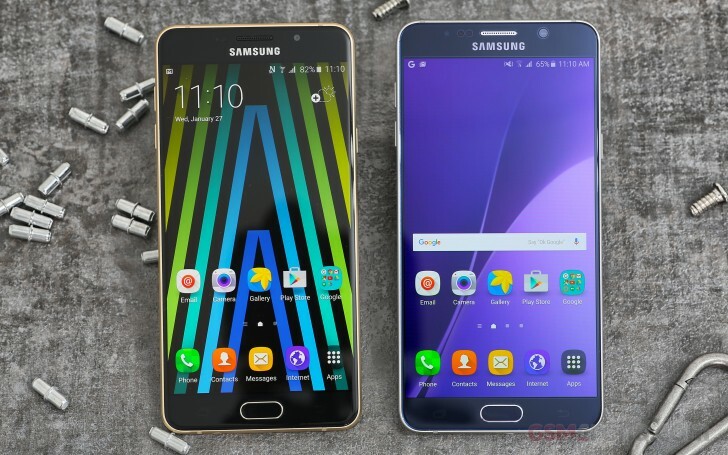 The Samsung Galaxy A7 (2016) has not changed much from its predecessor. It weighs more and is a millimeter thicker too, most probably due to the bigger battery (2,600mAh to 3,300mAh). Improvements start at the front. The Home key is now a fingerprint reader that secures your phone and Samsung Pay transactions. Also, the selfie camera above the screen has a brighter aperture, though a slightly narrower field of view (FoV). The camera on the back shows a much bigger improvement. For starters, it doesn't protrude as much. It also adds Optical Image Stabilization (OIS) and a brighter aperture for better-looking videos and better night shots. It does not go as high as 4K video or 1080p@60fps video and it uses the same chipset as the 2015 model. There's an extra gig of RAM, more on performance later. Also, it has a single LED flash (again) with no sign of the biometric sensors that the S-series and the Notes boast. The large card slot is on the right side of the A7 and on our unit it can house two nanoSIM cards or one SIM and one microSD. This means you can't have all three cards at the same time. Note that there's a version of the phone, SM-710FD, where SIM1+microSD go on one tray and SIM2 is on a separate tray. That solves this issue, but not all Galaxy A7 (2016) dual-SIMs have two trays, so watch out. And there's a single-SIM version, of course. Anyway, also on the right is the Power key. Like the volume keys on the left, it's rather small and thin, making it not very comfortable to use. The bottom holds the remaining items of interest. The 3.5mm audio jack and the microUSB 2.0 are right next to each other, as are the single loudspeaker and one of the mics (there's another one on top). The Samsung Galaxy A7 (2016) comes in Black, White, Gold and Pink. The metal sides and the material behind the glass on the back are painted the same color while the front is black on all but the White option. Yes, the front is black even on the Pink one. In the hand, the A7 (2016) carries its weight much better than the A5 (2016), even though the difference in physical size isn't that big. In fact, we had both at the same time (both in Gold) and they were really hard to tell apart.